We discovered Agnes Johns thanks to her granddaughter, Christy Langan, who told us about her wonderful cooking while dining with us one evening. Christy, along with her sisters Cathy and Cindy, own the Empire Room, a wonderful café and bar on upper Hawthorne Boulevard, where they feature a few of Agnes’ recipes. She shared her grandmother’s cookbook with us, and this month we share it with you. mother-in-law. As a teenager, Agnes used her skills while working in a cook car feeding hungry farm hands. 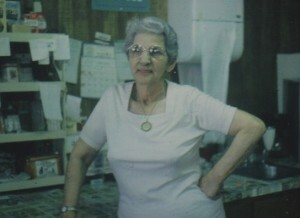 Agnes was famous for her prowess at fishing and was called the “great fisherman” in more than one Midwestern town. In 1938, Agnes married Jerry Johns and together they raised their family of seven children. In 1952 they moved to Portland, where they operated a grocery store and then a variety store until 1963. After Jerry’s death in 1962, Agnes retired until 1979 and then once more ventured into the grocery store business. She was involved in her community wherever she lived – as an instructor for the 4-H program in North Dakota & Montana, and then in Portland, Agnes found much fulfillment and satisfaction with her involvement in the St. Sharbel’s Maronite Catholic Church. There she was one of the founders of the Ladies Guild, and was an inspiration in the preparation of the annual dinners and bake sales held by the parish. Agnes believed in two important dictums. First, some people regard discipline as a chore, but Agnes looked at it as a kind of order that set her free to fly. Second, challenges make us discover things about ourselves that we never really knew. It was a wonderful challenge putting together this menu of Agnes’ specialties and we discovered how much we like Lebanese food! Enjoy!